Available on this section all sort of LNB's . Brands available : Inverto, Invacom, MTI, Technomate, DarkGold, Lemon, Alps, SKY and more..
Technomate 0.1dB Single Super High Gain digital universal LNB for fixed and motorised systems . Low Noise LNB , Ideal for weak signal areas. This LNB is one of the best LNB available in the market and it has a very good performance overall..
Technomate 0.2 dB High Perfomance LNB . 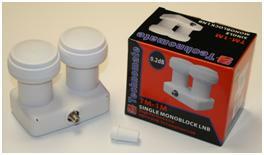 Low Noise LNB ideal for fixed and motorised. 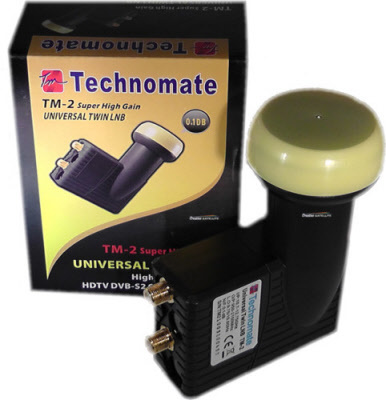 Technomate 0.1dB Super High Gain Twin digital universal LNB for fixed and motorised systems . Low Noise LNB , Ideal for weak signal areas. Connect 2 Receivers to One dish or a Twin PVR Receiver. 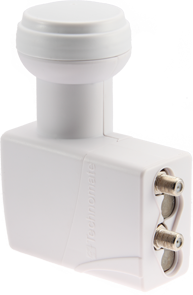 Technomate 0.2dB High Perfomance Twin digital universal LNB for fixed and motorised systems . Low Noise LNB , Ideal for weak signal areas. Connect 2 Receivers to One dish or a Twin PVR Receiver. Invacom 0.3dB Twin digital universal LNB, Super Low Threshold 0.3dB Twin Output LNB suitable for fixed systems to connect up to 2 receivers . Low Noise LNB , Ideal for weak signal areas. 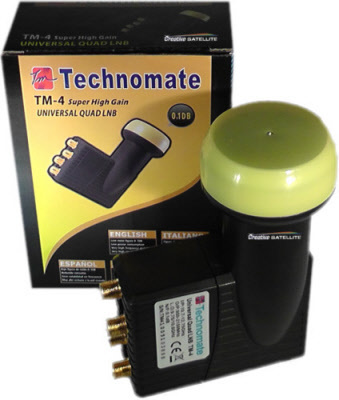 New- Technomate 0.1dB Super High Gain Quad digital universal LNB for fixed and motorised systems . Low Noise LNB , Ideal for weak signal areas. Connect 4 Receivers to One dish or 2 Twin PVR Receiver. 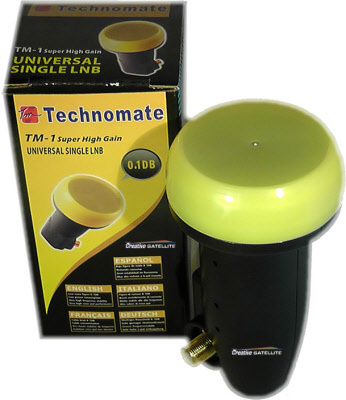 Technomate 0.2dB High Perfomance Quad digital universal LNB for fixed and motorised systems . Low Noise LNB , Ideal for weak signal areas. Connect 4 Receivers to One dish or 2 Twin PVR Receiver. Best LNB available, Super Low Threshold 0.3dB Quad Output LNB. 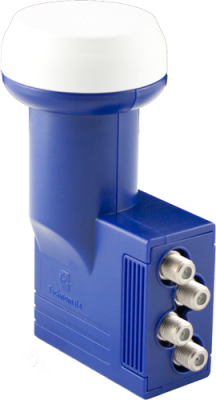 Invacom 0.3dB Quad digital universal LNB suitable for fixed systems to connect up to 4 receivers . Low Noise LNB , Ideal for weak signal areas. Technomate 0.2 dB Single Monoblock LNB with built in DisecQ allows you to receive Astra 1 ( 19.2” East ) and Hotbird ( 13” East) from one fixed dish and only requires one cable to the LNB. Suitable for DiseqC digital receivers. Inverto White Tech 0.3dB C-120 Flange Quad digital universal LNB suitable for fixed systems to connect up to 4 receivers . 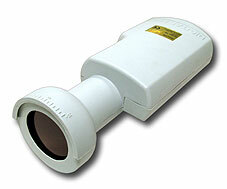 Low Noise LNB , Ideal for weak signal areas. Technomate Brand DiSEqC 4 Way SAT SWITCH. 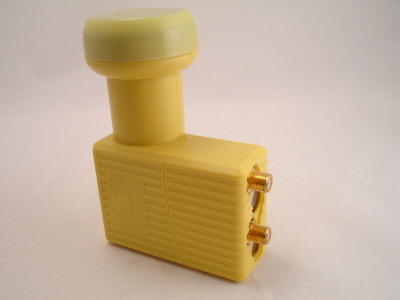 This four way diseqc switch enable you to connect up to four satellites / LNB's running on one single cable to the receiver. It has an automatic switch. Technomate Brand DiSEqC 2 Way SAT SWITCH. This Two way diseqc switch enable you to connect up to two satellites / LNB's running on one single cable to the receiver. It has an automatic switch.